The AMC-1 performs transparent conversion of single mode and multimode fiber optic signals for protocols such as ATM, Token Ring and Ethernet. It operates at data rates up to 155 Mbps and supports most optical codes except for multi-level optical codes. Supports hot-swappable, electrical and fiber optic modules, including long-haul and WDM interfaces. The modules are compatible with RAD's AMC-101, universal media converter and repeater. 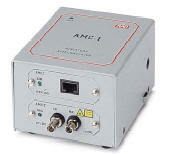 The AMC-1 is a miniature media converter that is used to connect equipment with different physical media, providing fiber optic to STP/UTP conversion. Multiple connector types are available for both optical and electrical interfaces. The AMC-1 is a desktop or wall-mounted standalone unit and is supplied with an external DC power supply.